Designated a National Natural Landmark in 1973, Amboy Crater was recognized for its visual and geological significance. Although Amboy Crater is not unique, it is an excellent example of a very symmetrical volcanic cinder cone. The inside of the 250' high crater contains two lava dams behind which has formed small lava lakes. These are now flat in general appearance, covered with light colored clay, creating the impression of miniature "dry lakes." There is a breach on the west side of the crater where basaltic lava poured out over a vast area. Beyond the crater lies 24 square miles of lava flow containing such features as lava lakes, collapsed lava tubes and sinks, spatter cones and massive flows of basalt. 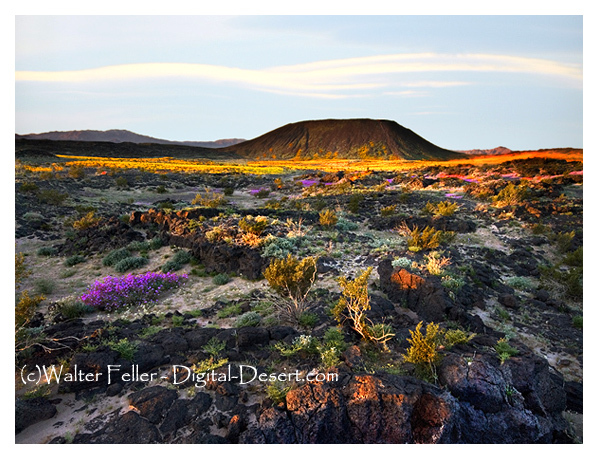 If the rainfall has been adequate, the spring months from March to May can bring desert wildflowers! Blankets of desert primrose and sand verbena provide an excellent area for photography. The unique landscapes found at Amboy Crater have attracted the filming and research industry. As a result of increased visitation to Amboy Crater, the Needles Field Office established a day use site. The entrance road to the parking area has been improved to provide access for all vehicles. ADA accessible shaded and un-shaded picnic tables and restrooms offer a place to relax while exploring the area. As well as shaded crater viewing platform, Interpretative and trail information along with desert safety tips are available on-site. Large groups should park in the group parking area. The Needles Field Office is encouraging educational groups and organizations to contact the office prior to their trip to ensure parking is available. 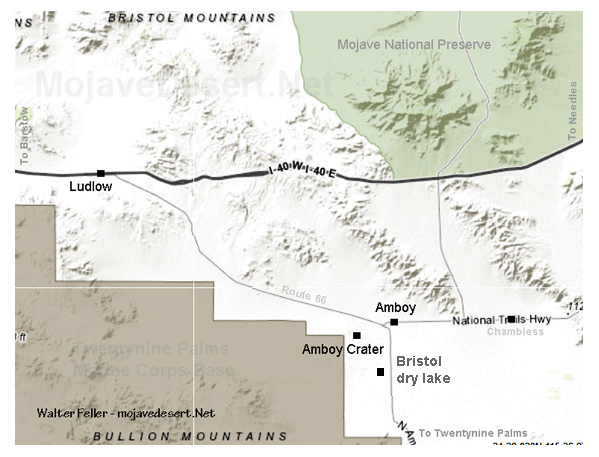 Amboy Crater is located in the Bristol Valley, midway between Barstow and Needles and is about 75 miles (120 km) from either of these small cities. Amboy Crater is accessible to tourists via Interstate 40 as well as National Trails Highway - Route 66. The tiny town of Amboy, the home of Roy's Cafe, a few miles to the east, has few, if any ammenities. The closest town to the west is Ludlow.